hahah, the fan art is amazing, he does not skip leg day. 1. New and (probably) final lighting system is finished! It now runs half-half between shader and code. The code grabs the lights in the level and generates up to 3 arrays of tiles, sends them all to the shader, and the shader generates colors based on the data and blends them and all that cool shader stuff. The colored lights work completely now. 2. Particles! You can see them in the torches. Just a neat small effect. The lighting is pretty heavily affected by the color behind it, specifically its brightness. The brighter it is, the less opaque i can make the light, which is good because the more opaque the light, the less visible anything beneath it is. Moving all the lights to a shader helps this a bit because i can make it more additive (which it is now), but it's still not the best. 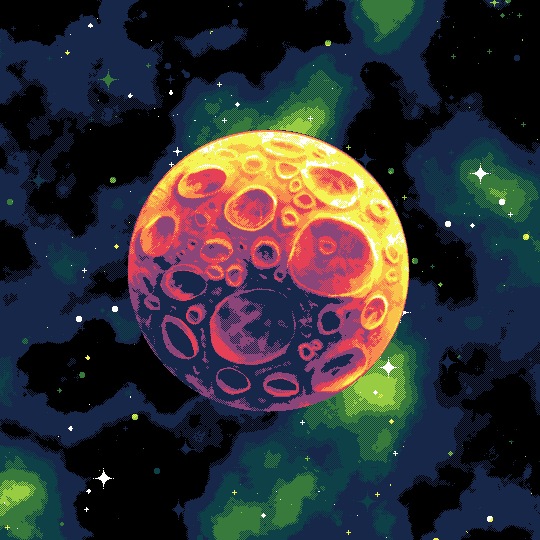 Having these background layers darken for each layer, while looking really cool, really screws with the light colors. Because of this, i was forced to create a system where i can change colors of an image, generate the data i need from it with a java program, send it to a .txt file, and have the game load it during run-time and switch the colors of the lights, allowing me to nudge colors until it looks good on most background colors/brightnesses. I think I've done a pretty good job with the ones in the gif! This will continue to get annoying for each additional area in the game, with its own set of background colors, so i'll have to make different alterations of lights for different areas. But this system will help out a lot with that! Crystal wires connect from those crystal things to any source such as light/dark blocks, etc! They work wonderfully, I just need to think of more things for them to interact with! Love the waterfall (and everything else). Keep up the good work! whew boy, it's been a while! I took a contracting job to make a mobile game (in stencyl) which took a long time and is the main reason for my absence on the game. That has been recently finished and released, and I have since started working on Ghost Bird again! I began by deciding to remake the whole game. I built off of the original LD build into what it is now, meaning theres a ton of left over crappy code and assets that i don't want. I'm basically going to be manually programming the most important parts (game scale stuff) and copy/pasting the complicated stuff (shaders and lighting)and probably just copy-paste all the other stuff while moving things around, etc. this is mainly progress from rebuilding the game. the previous images were all on the previous build. 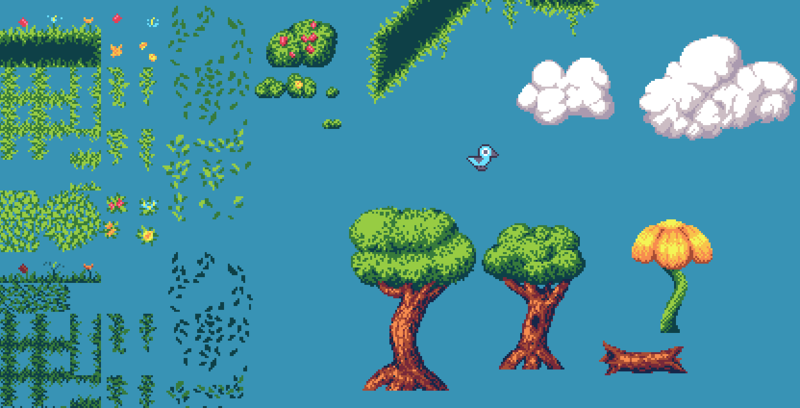 This one is (and will be) a lot cleaner, but most of this is copied code so its not much faster, but that's fine. I have finally gotten around to fleshing out the design for the world/story/etc. with the help of a friend or two. I've mapped out the base layout of the world, including zones and path progression. I've also figured out a general story and some branching paths/endings. Next will be to go into more detail, designing rooms and puzzles, etc. and finallyy neW THINGS IM EXCITED ABOUT! Check out these new and improved shrooms!! The thing I disliked most about my lighting, specifically the colored lights part, is that it washed out, flattened, and overpowered basically everything on screen in that area. I've spent the most time tweaking color values in such a way to minimize over-flooding necessary detail, while maximizing the prettiness of the lights, because the less opaque I make the lights, the less likely i'll get the colors to match up to the ones I want in my palette. 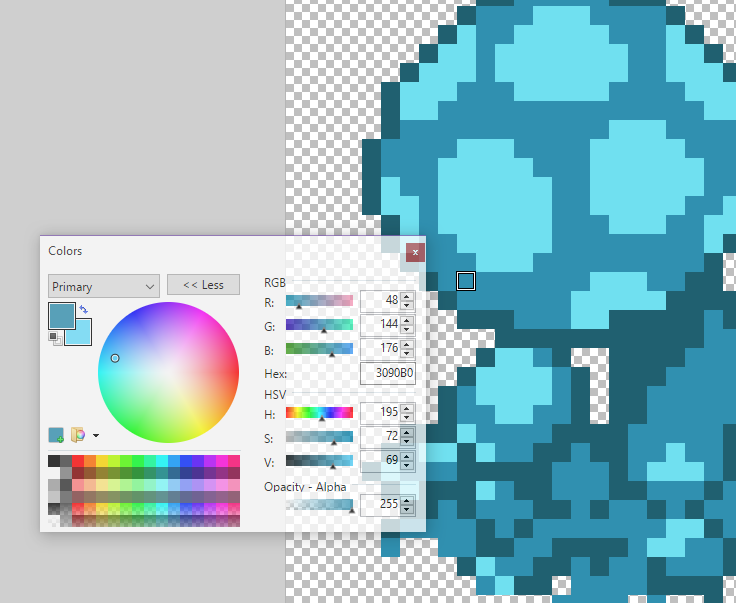 for instance: the brightest blue in that latest gif needs to be fairly opaque in order to turn out that color, but because I couldn't draw beneath the shader, it would just make every pixel in that area that color, and I really hated it. You can tell in the older mushroom gif how low-intensity the lights are. That's the other end of the extreme, and neither looks that great in my eyes, or at least it's not perfect. This is what they looked like before, and what they would've looked like if I didn't make the lights so dim. The light itself looks so much cooler, but it's totally useless if you can't see what's emitting it! 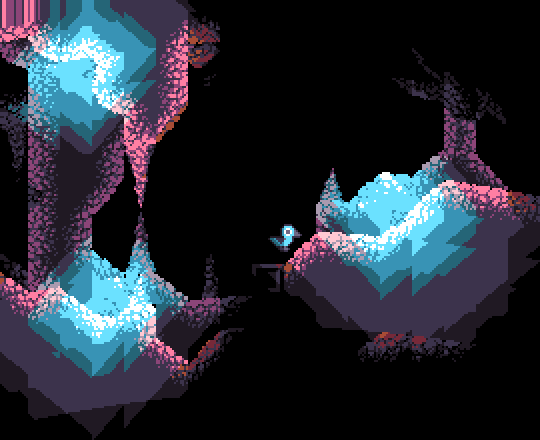 So, I basically needed a way to draw between the shaders. I have 2 different layers of lighting here: One in front of tiles, and one behind. and both are behind this beautiful ghost bird. This was great because I could have high-intensity light on the background, while maintaining detail on the tiles and other stuff immediately behind the light. Just like the dumb hacky way I'm currently sending the tile data and light color arrays to the shader (arrays of 10-digit integers, mod-ing/floor dividing to grab sections of digits as data), This "fix" is too, dumb and hacky. Basically I'm doing another check in the lighting shader to see if it should draw onto the current pixel or not. The only data any pixel could have is 3 8bit RGB colors (and a useless constant alpha). So What I'm doing is i'm quantizing (boy I guess I love this word) each 255 integer to a multiple of 16, and checking if each R G and B value is a multiple of 16, and iff it is, don't draw on top of it. Because this is terrible and hacky, this basically only works in the case that Ghost Bird is in currently. I'm restricting the game to a small color palette, so I can almost guarantee that none of the colors in the game will randomly create a false-positive for this check. Even the lighting that uses very much off-palette colors, which used to be drawn on screen normally, is being drawn within the same shader so there's no way these colors could accidentally create false positives either. Any other game and there would be random misplaced pixels. Also I'm not too sure about the nitty-gritty details of shaders, but this extra check could possibly be saving GPU time. I've read that if-statements are not good because of divergence (maybe this specific check is ok though? ), so that may attribute to a slower shader, but if it's not too much slower the check basically exits the whole shader code for that pixel, which has a ton of stuff like color blending, etc. But yeah. There you go. Final annoyance solved. I have full control over what colors are drawn to the screen. I no longer have anything to whine about besides my own working speed. Time to go make everything even more pretty!